Portfolio-Based Language Assessment (PBLA) is a teaching and assessment model designed to enhance nationwide consistency and standards of quality in English as a Second Language (ESL) training for adult newcomers to Canada. 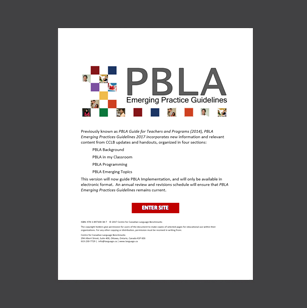 PBLA is grounded in recognized best practices in language instruction and assessment for adults. It is aligned to the Canadian Language Benchmarks (CLB), Canada’s national standard for describing, measuring and recognizing the ESL proficiency of adult immigrants and prospective immigrants. The French equivalent of PBLA: Évaluation Linguistique Basé sur le Portfolio (ELBP) will be implemented in CIC’s French-language training program — Cours de langue pour les immigrants au Canada (CLIC) and in Ontario’s French as a Second Language Program. The Centre for Canadian Language Benchmarks (CCLB) is supporting Citizenship and Immigration Canada (CIC) to implement PBLA in Language Instruction for Newcomers to Canada (LINC) programs across Canada, as well as in ESL/FSL programs in some provinces. What is Portfolio-Based Language Assessment? Portfolio-Based Language Assessment (PBLA/ELBP) may be a new term but many of its principles and methods are common practice in second-language training for adults. PBLA/ELBP strengthens and formalizes approaches already used by many ESL/FSL teachers, while adding new elements that will further benefit learners, teachers and administrators. PBLA/ELBP provides an alternative to traditional testing practices, in particular the use of standardized or externally developed tests at the end of a term. In the PBLA/ELBP model, the teacher carries out ongoing assessment in the classroom, providing multiple opportunities for teachers and learners to reflect on and make plans to advance the learner’s journey towards ESL/FSL proficiency. PBLA/ELBP embeds assessment into the teaching/learning cycle, building on decades of research into “assessment for learning” principles. Teachers can provide immediate constructive feedback to learners and can more readily make adjustments in the course of teaching. Learners are more actively involved in assessment and in collaboration with the teacher, can set realistic learning goals and monitor their progress — which increases their capacity for self-directed learning. Instruction and assessment in PBLA/ELBP are aligned with the Canadian Language Benchmarks (CLB) — Canada’s national standard for describing, measuring and recognizing the proficiency of adult immigrants and prospective immigrants in English as a Second Language (ESL). The CLB standard is a descriptive scale of language ability in ESL, written as 12 benchmarks or reference points along a continuum from basic to advanced. In PBLA/ELBP, each learner has a “portfolio” — a binder known as the Language Companion that documents their learning journey and collects evidence of their progress in language tasks over time. It includes drafts and revisions, not just final products, which allows a learner to see how they have progressed in their language skills. It contains information on the learner’s specific needs and goals (many of them identified by the learner), in relation to the CLB. It provides the opportunity for a learner to comment on their work, and to reflect on their achievements and what they are most proud of — both on their own and in conversation with the teacher. Giving learners the tools to undertake self-assessment and reflection has been shown to have a positive effect on learning. The goal is to have Portfolio-Based Language Assessment (PBLA) in place in Language Training for Newcomers to Canada (LINC) and CLIC programs across Canada by 2016. PBLA is being introduced to LINC through a phased-in approach that stresses professional development, mentoring and support. Some provinces are also planning to implement PBLA in government-funded English as a Second Language (ESL) programs. Portfolio-Based Language Assessment (PBLA) is being implemented through a four-tiered model of professional development, mentoring and support. The implementation model for Portfolio-Based Language Assessment — with its transfer of knowledge from Regional Coaches to Lead Teachers and from Lead Teachers to Classroom Teachers — will foster the building of a strong, ever-expanding community of practice. Along with extensive in-person coaching and online training, teachers and program administrators involved in English as a Second Language (ESL) programming have access to a variety of resources to support curriculum planning and use of best-practice approaches to instruction and assessment. Portfolio-Based Language Assessment (PBLA) provides a number of benefits to learners, teachers and program administrators involved in Language Training for Newcomers to Canada (LINC) programs and in English as a Second Language (ESL) programs in some provinces —and strengthens the programs overall. Having a consistent, national approach to teaching and assessing in LINC programs increases the portability of language credentials throughout the country. This means that everyone — learners, program administrators, teachers and employers — will have a common basis for understanding learners’ assessment results across different programs and in different parts of Canada. With a consistent, more formalized framework for instruction and assessment, PBLA will enhance the accountability of governments, program administrators and teachers for learner language-skills development, and will help demonstrate the value of investments in language instruction for newcomers to Canada. Learners are motivated to take a more active role in their learning, by participating in the setting of realistic goals, developing learning plans and monitoring their own progress. Having more “ownership” of the learning process helps them to achieve better results. Learners are provided with more visible evidence of their progress and a more concrete connection between their language-learning activities, the skills they are acquiring, and Canadian Language Benchmarks (CLB) levels and competencies. Working within the PBLA model helps learners develop important skills and concepts that can transfer to other life, work and school contexts. Teachers have a standardized approach to measure student advancement and more information on how to adjust teaching approaches in response to learner needs and goals. PBLA builds on and enhances teacher expertise in instruction, assessment and the Canadian Language Benchmarks (CLB). Teachers have strong opportunities to share resources and approaches with their peers, on the basis of shared methods and principles, as well as a common language about learners’ skill levels. Program administrators oversee language training that is reliable and consistent with best practices in second-language instruction. Administrators receive support and more comprehensive data for program decision-making. Feedback from the field-test of PBLA in Ottawa indicated that this approach increased student retention in the language programs.